Gallia Academy freshman Brayden Easton (64) shoves Rock Hill running back Zak Adkins to the ground during the first half of Friday night’s 43-20 victory in a Week 8 Ohio Valley Conference matchup at Memorial Field in Gallipolis, Ohio. Gallia Academy sophomore James Armstrong (3) tries to elude a pair of Rock Hill defenders during the second half of Friday night’s 43-20 victory in a Week 8 Ohio Valley Conference matchup at Memorial Field in Gallipolis, Ohio. GALLIPOLIS, Ohio — On the 70th anniversary of calling Memorial Field home, the Blue Devils put themselves in a position to make even more football history. 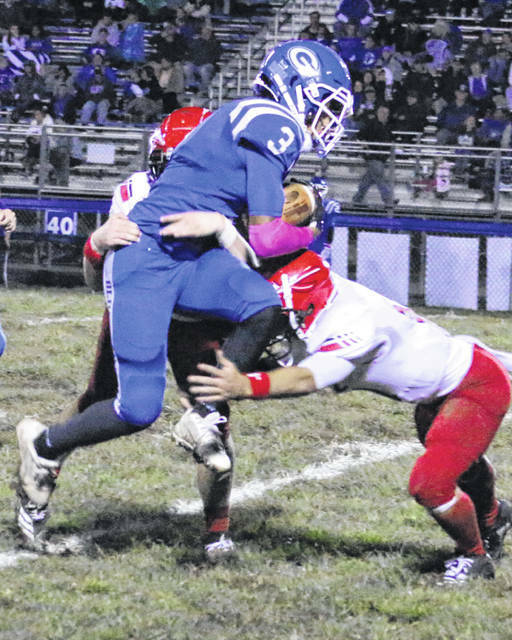 Gallia Academy led wire-to-wire and forced three second half turnovers — which led to 14 pivotal points — while setting up a date for the program’s first-ever Ohio Valley Conference title after posting a 43-20 victory over visiting Rock Hill in a Week 8 contest Friday night in the Old French City. The host Blue Devils (7-1, 5-0 OVC) found themselves in a dog fight for two quarters, as the Redmen (2-6, 1-4) forced the only first half turnover and churned out 179 rushing yards while hanging around in a 14-13 contest. The Blue and White, however, limited RHHS to just 99 yards of offense after the break, plus pitched a third quarter shut out that resulted in a 30-13 advantage headed into the finale. The Red and White closed the gap down to 30-20 nine seconds into the fourth, but the hosts responded with 13 unanswered points to wrap up their fifth consecutive victory — and a date with Ironton next Friday for the outright lead in the OVC standings. Both teams had three possessions apiece in the first half, and the Redmen held a 179-148 advantage in total yards … as well as being plus-1 in turnover differential. Still, the Blue Devils were able to take a slim one-point edge into the intermission. And, according to second-year GAHS coach Alex Penrod, it was at halftime that both his staff and his troops found some common ground. “Through 10 weeks of a season, you are going to battle some ups and downs and face some adversity along the way,” Penrod said. “There’s been a lot of things going on this week with not having school, but we came down those steps ready to play. I also think that Rock Hill showed up ready to display their power football team and tried to slow things down on us, which doesn’t normally happen. Gallia Academy opened the second half with an onside kick that was successfully recovered by Daneuvyn Woodson, giving the hosts possession at their own 48. And although the Blue Devils ultimately punted the ball away for the only time on the night, it did help set the tone for what ensued. On Rock Hill’s second offensive play, Ryan Donovsky forced a fumble that he also recovered at the RHHS 37. Four plays later, James Armstrong hauled in a 22-yard pass from Justin McClelland that gave GAHS a 22-13 advantage with 8:20 left in the third period. The Redmen were forced to punt on their ensuing drive, and the Blue Devils answered with a 5-play, 63-yard drive that ended with an 8-yard run by Lane Pullins. McClelland converted the 2-point conversion run with 4:21 showing in the third, making it a 30-13 contest. Brayden Friend capped a 9-play, 65-yard drive with a 24-yard scamper, allowing Rock Hill to close to within 30-20 with 11:51 remaining in regulation. Gallia Academy, however, answered with an 8-play, 68-yard scoring drive that ended with a Jacob Campbell 11-yard TD run at the 9:17 mark for a 37-20 cushion. Trentin Waller recovered a fumble on Rock Hill’s third play of the ensuing possession, which gave the hosts the ball at the RHHS 34. The hosts covered the distance in five plays as Armstrong jetted around the outside from 15 yards out, giving the Blue and White a 43-20 advantage with 6:26 remaining. Overall, the Blue Devils finished the night plus-2 in turnover differential and outgained the guests by a sizable 412-278 margin in total yards of offense. 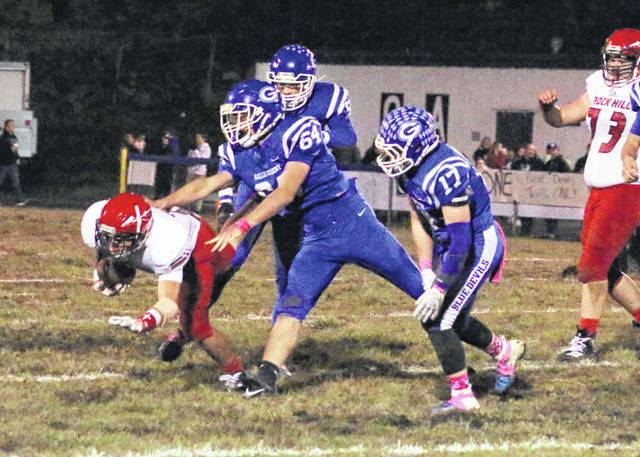 After the break, Gallia Academy’s offensive advantage was a staggering 264-99 in total yards. Penrod noted that his defense definitely answered the bell after halftime, and the offense was the primary benefactor of the extra work. Campbell gave the hosts a permanent lead following a 2-yard run at the 8:48 mark of the first period, then added a successful two-point catch on a McClelland pass in building an 8-0 edge. The Redmen answered with a 14-play, 79-yard drive that ended with a 10-yard scamper by Friend on fourth down, allowing the guests to close to within 8-7 with a minute left in the first. Campbell added the second of three TD runs seven seconds into the second quarter following an 11-yard scamper, allowing the hosts to secure a 14-7 advantage. The Redmen countered with 14-play, 65-yard drive that ended with a 22-yard run by Zak Adkins at the 4:36 mark. The extra-point kick was blocked, allowing GAHS to maintain a 14-13 lead. The Blue Devils followed with an 8-play drive that ended up getting down to the Rock Hill 14, but Jake Bevins recovered a fumble that allowed the guests to take over on downs with 2:16 remaining. RHHS ultimately ran out of time and entered the break down by a single point. Gallia Academy claimed a 26-18 advantage in first downs and rushed for 278 yards on 54 carries. The hosts were also flagged eight times for 40 yards. McClelland led the ground attack with 81 yards on 13 carries and also went 13-of-19 passing for 180 yards and a score. Campbell added 46 rushing yards on eight attempts, while Pullins churned out 39 yards on nine totes. Cory Call led the GAHS wideouts with four catches for 51 yards, while Armstrong added 46 yards on four grabs. Donovsky, Waller and Woodson each recovered a fumble, while Coen Duncan recorded the team’s lone sack. The Redmen had two of the three punts in the game, did not have single yard in the passing attack and was also penalized five times for 45 yards. Logan Hankins led the guests with 81 rushing yards on 14 carries, while Adkins also had 81 yards on 18 attempts. Friend finished the game 0-for-1 passing. Ironton — which defeated Coal Grove by a 21-12 margin on Friday night — also improved to 5-0 in OVC play. The Blue Devils have lost their last four contests at Tanks Memorial Stadium, with the last victory coming by a 14-7 margin in 2006. Gallia Academy also has a chance to secure at least a share of the program’s first league championship since winning the Southeastern Ohio Athletic League title outright during the 2012 campaign.